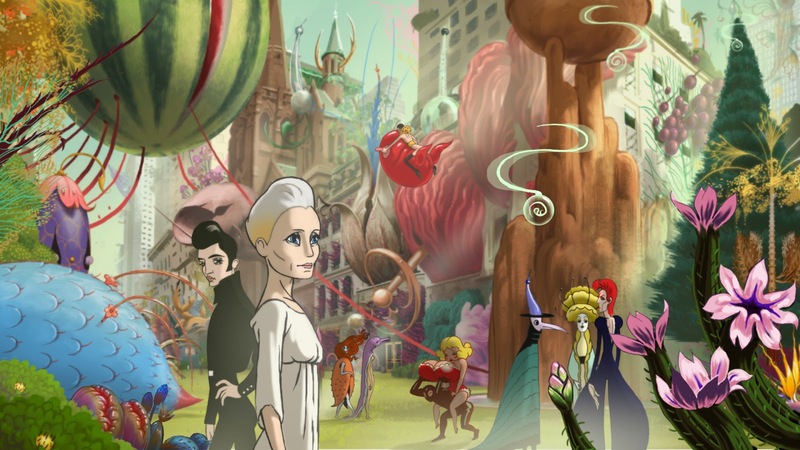 Ari Folman is primarily a director of animated films (as he demonstrated in the wonderful, Oscar nominated animated documentary, Waltz with Bashir), and it shows in his latest effort, The Congress, a live action/animated science fiction hybrid based on Stanislaw Lem's novel, "The Futurological Congress." The live action segments of The Congress, mostly bookended at the beginning and end of the film, feel a bit drab and uninspired. But what a jaw dropping beauty those animated parts are, so much so that by the time we return to the real world in the film's finale, their blandness is jarring, suddenly making sense in a very carefully designed world borne out of Folman's vivid imagination. At its core is a performance by Robin Wright that can only be described as fearless. Rarely do actors or actresses allow themselves to be so emotionally naked onscreen, but in playing a version of herself, a former starlet turned actress of a certain age who is no longer Hollywood's "it-girl," Wright turns in a raw, self reflective performance that is nothing short of exhilarating. In The Congress, Wright is an actress facing irrelevance in a world that no longer seems interested in her talents. Her manager, Al (Harvey Keitel), is negotiating her final contract with movie studio Miramount, whose president, Jeff (Danny Huston), is planning to scan the faces of every actor into a giant database that will render actors obsolete. In essence, movies will no longer feature flesh and blood people, but digital approximations capable of doing anything the studio demands, never aging, never fading, always young and always exactly the same. The actors must sign a contract to never again perform in any capacity, in order to preserve the cinematic illusion of agelessness. The actor's likeness will forever belong to the studio. Flash forward 20 years. Wright has taken the buyout, and is traveling to make an appearance at the Futurological Congress, a gathering held in an all animated zone, where hallucinogenic drugs take people to an alternate reality where everything is animated. There, the Congress plans to announce the release of the drug on the mainstream market, where anyone can escape into the animated zone and be anything or anyone they want. Identity is a thing of the past in a world where reality no longer has any meaning. Lost and alone amidst a sea of animated oddities, Wright must reunite find her children, even if it means escaping into reality and losing her only love. It's a sprawling narrative, but its often scattershot nature is the point. Nothing makes sense anymore, not in this new animated world. And just when you think this thing is about to fly off the psychedelic rails, Folman pulls it all back in, grounding it in real human emotion. That's what's really so fascinating about The Congress; Folman has created a fantastical world like nothing we've ever seen before, where people can be anyone from Marilyn Monroe to Cleopatra, or something completely out of their own dreams (or nightmares), but it's never anything less than completely emotionally engaging. The final impact of this thing is tremendous, blindsiding us with its surprising resonance. There are moments of such beauty in The Congress that it's almost breathtaking. It's also a bold and incisive satire of our current moviegoing culture. One need only look at this year's highest grossing film, Transformers: Age of Extinction, to see what Folman is skewering here - a world where CGI robots are the stars and the humans are perfunctory at best. Who needs real human emotions anymore when you can do anything with a computer? In The Congress, Folman argues the opposite - those human emotions are what bind us all together. They are essential to our very beings. They are us. And no computer can ever replicate that, no matter how much studios may want to cut corners or churn out yet another soulless blockbuster. This is an extraordinary film, a unique film, the kind of film that reminds us of the true power of science fiction to comment on our society. But it's also a film of very delicate beauty, from Folman's startling imagery to Max Richter's heartbreaking score - The Congress stands as a refreshing reminder of the singular power of cinema. 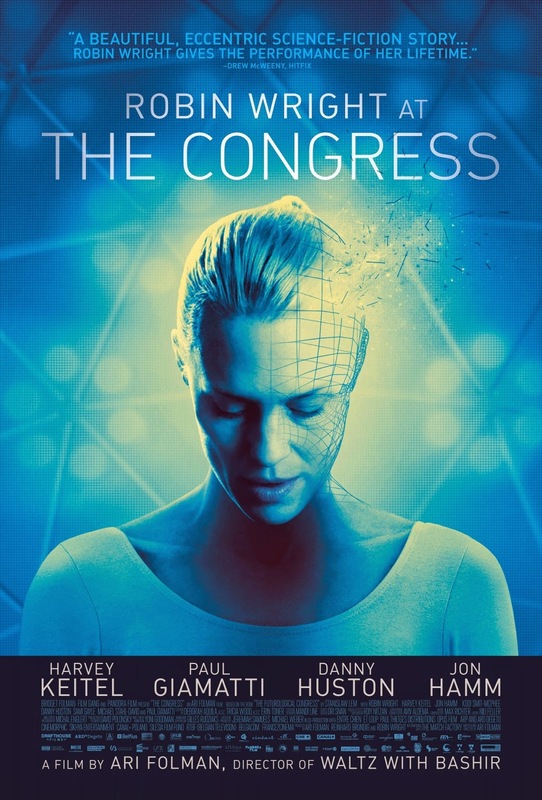 THE CONGRESS | Directed by Ari Folman | Stars Robin Wright, Harvey Keitel, Danny Huston, Paul Giamatti, John Hamm | Not Rated | Now playing in select cities.